“It is wonderful, & beautiful — particularly the sound, and the length, which both are perfect — nature is slow… those digitalkids & iphonephreaks who believe they live in a soundbyte world, don’t — there are entire worlds out there, surrounding them and containing them and of which they are a tiny miniscule and unimportant part, which move far more slowly — Nature is one of those, Geology moves far more slowly even than that — Astral events, the stars, move both far more slowly and sometimes a whole lot faster, than they do — let the slowness here, decorated so wonderfully by that chirping-birds & airplane soundtrack, remind them of their own relativity in all of that”. To begin with, patiently, she stands there, super alert, watching and listening, triangulating her ears from side to side, and nodding her head back and forth to exactly and precisely locate her prey by sound. Soon thereafter, at 1:44 she tenses, getting ready to leap, backs up a little bit and then springs up and down into several pounces, landing hard on her forepaws with a series of “punches” meant to knock in her prey’s intricate tunneling system underground. This prevents the gopher from escaping through that tunnel network. This lasts until 2:05. At 2:17 she begins furiously digging and digging, both deep into the ground to break through into the tunnels, and on the surface to move the ground-cover out of the way, all the while continually keeping a wary eye on her surroundings, including me and folks walking in back of me. At 3:28 she catches her prey, disables it, and tosses it to the ground. Then, by looking around, she assesses how safe it is to eat right it then and there. She decides it’s not so safe, so she runs off with it. At 3:36 until the end of the video, she eats her prey, tearing into several more manageable eating portions and chewing these down to swallowable sizes — it takes a while, and then she calmly walks off. Note that there is no waste — she eats every bit of her prey: entrails, muscles, fur and bones. This young female coyote spent considerable time rubbing and scratching her sore eye with her wrist, possibly even with her dew claw. When her wrist was not up in her eye to relieve the itch or pain, or possibly to dislodge the irritant, you could see that the eye was red, swollen, teared-up and recessed a little. I don’t know what was going on, except that it bothered her. I’ve seen quite a number of eye-injuries or irritations in coyotes, so it must be a fairly common malady. They are close to the ground where sticks, brambles, grit and bugs could easily get caught in and become lodged in their eyes. Coyotes are particularly dependent on their binocular vision for hunting, so it was important for her to take care of her afflicted eye. We all tend to forget that wildlife has its share of ailments and injuries, not dissimilar to our own, and that even if these don’t incapacitate an animal, they make it that much more difficult to perform their daily living routines, and can serve to shorten their lives. By the time I saw her on the next day she was no longer tending the eye — the affliction had passed. Hey everyone, the rules of “don’t feed” are to discourage healthy coyotes from hanging around, but when a coyote, or any animal for that matter, obviously and badly needs help, we need to help it. The advice given to this neighborhood — to not leave out food or water — was thoughtless advice imposed from “rules” that have become too generalized. Coyotes who are affected by mange, or anything that alters their appearance, are shunned by other coyotes and ousted from their social groups and their territories. Besides causing a very obvious change in the coyote’s appearance, mange also is extremely contagious. The mite causing the skin disease burrows deeply, causing excruciating itching. The coyote scratches so hard that bald spots result on his skin. The skin, then, cannot carry out its protective function. Slowly, all bodily functions become diminished. The shunning of such an animal by other coyotes may serve to isolate the animal so that these other coyotes do not get infected by the mite. Shunned animals have to make it on their own now, in unfamiliar areas where they may not know the best food sources. So they become more visible not only because they look odd and have lost their camouflage, but also because they are now moving around in new, unfamiliar areas where survival is now that much more difficult. So mange causes both social and bodily issues for coyotes. People could have helped this coyote both with food and with medications until the animal could be caught and helped more intensively. Instead they were instructed to stick to “rules” which did not fit “the case”. Let’s be humane towards our wild animals — here we could have helped abate the misery of an already suffering animal. “My dog is the mildest, shiest dog I’ve ever known. She startles at everything — runs from the drop of a pin. Yet, two coyotes approached her anyway, dashing in our direction from the distance. At first I thought they were two dogs who wanted to play, so I didn’t do anything, but as they hurried closer, I realized my mistake too late. A coyote doesn’t care if your dog is aggressive or mild — all the coyote cares about is that the dog is in its space. In fact, it is often the calmer dogs that coyotes attempt to *message*, either through body language (which most dogs can’t read) or more directly by nipping the dog’s haunches if the coyote can get close enough. 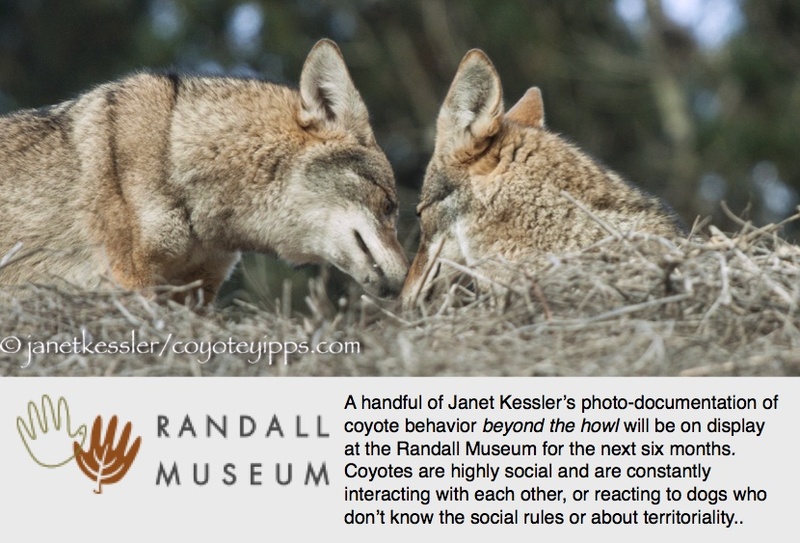 Coyotes may pick a milder dog to message simply because they are able to do so — it’s easier — whereas it is more dangerous, in their eyes, to message an aggressive dog. So a dog’s mildness is not a factor in attracting a coyote’s interest to a dog. Whether calm or barking aggressively and lunging at them, any dog could be “messaged” to move it away. Remember that coyotes would do the same for intruder coyotes — this is a function of their territorial behavior. It appears that this particular dog and owner happened upon one the coyotes’ favorite “lookout” spots — folks had seen the coyotes often relaxing in this spot. The dog was standing there, in a solidly planted stance, as if he were claiming the spot, staring at the coyotes as they came in closer. Another contributing factor may be that these coyotes might have just been chased by another dog — dogs chase coyotes often. I’ve noticed that sometimes coyotes are more eager to “message” other dogs when they themselves have just been provoked by intrusive dogs, and I’ve seen them choose a milder dog to do so. This can be prevented by moving away from coyotes the minute you see them: doing so shows them that you are not interested in them and not there to threaten them or fight for the spot. Please always remain aware and vigilant when you walk your dog in a park with coyotes. If this owner had been aware from the start, she could have leashed and moved away as the coyotes approached — this is what the coyotes wanted, and it is something that is easy to do. And it would have saved the dog-owner from a lot of unnecessary fear and anxiety.